If you’re as crazy about steampunk as I am, then you’ll probably fall instantly in love with 1000 Steampunk Creations, showcasing the best in steampunk from around the world and the web. I was sourcing for inspiration for my latest costume at Planerds – a re-imagining of my Victorian vampire garb, when I chanced upon this title and flipping through the pages just totally blew me away. It’s hard to describe what’s in this book (since it’s full of pictures) save that it aggregates everything from steampunk home appliances (like that crazy re-skinned Mac computer) to fashion and accessories. What’s more, it covers all aspects of steampunk so there’s plenty to ogle at. Vintage aeronaut, adventuring gear, chic Victorian couture and dystopic togs – it’s all in there. Styrofoam is an effective material for crafting lots of props and armor pieces. I use styrofoam balls almost exclusively as the base of my shoulderpads, and it’s not entirely unheard of for cosplayers to shave styrofoam to the correct shape and size for weapons ornaments and frills, or to use expanding foam to craft the same. While styrofoam’s fairly easy to cut and shape (all you need is a heated blade and a firm hand), applying a coat of paint to the styrofoam, or even sticking it to another piece with glue can be a real hassle. The composition of styrofoam precludes the use of conventional methods, and here’s a little science lesson why. Styrofoam is composed of polystyrene, which is easily soluble in most chemical solvents. The propellants in spray paint cans, as well as the compounds of most liquid based paints (such as glass paint) will eat through styrofoam faster than you can say “cosplayer”. Same goes for most conventional glue products, which contain chemical solvents that prevent the glue from drying up, but has a rather nasty side effect on styrofoam. Tough luck, you might think, but here are some methods I’ve used, and items that have proven to be great workarounds. You can prevent paint from eating into your styrofoam prop by covering it with several layers of liquid varnish. Personally, I prefer Amsterdam Matt Varnish, which goes for about $10 at Art Friend and most major craft stores. Brush on three coats of liquid varnish – one coat at a time, and allowing intervals for the varnish to dry. If you’ve done this correctly, your prop should be protected by a thin, yet durable sheen that can be spray painted or glued on without hassle. Daler-Rowney's Cryla label is ideal for painting cosplay props. The best way to get around using aerosol paints is to stick with good, old fashioned acrylic. I normally use Daler-Rowney’s Cryla label, which has a great finish, some really neat color combinations, and most importantly, is fairly affordable. What’s more, Cryla paints are great to use with the Dry Brush method of painting, which leaves a polished, aged look on your armor and weapon pieces. Apply acrylic over a single coat of varnish, then varnish over when dry for best results. If you can get your hands on shellac (it’s available in most hardware stores), it functions the same way as liquid varnish, except you only really need a single coat to inure your styrofoam prop against the dangers of acetone and other solvents. You can also do the same with clear nail polish (couple dollars in SaSa and Daiso). Now on to glue selection. There’s only really two types of glue you can use reasonably well with styrofoam. One’s the UHU Por glue, which is foam friendly. I can’t count the number of times it’s actually saved my Warlock shoulderpads, replete with foam spikes and skulls, from falling to pieces. You can get a stick at Art Friend (about $5) or any reliable craft store. The other label is PVA Craft Glue, which is purchaseable from Spotlight for $7. Personally, I prefer UHU Por, but PVA tends to dry faster. In my previous “Mantle of the Corruptor” tutorial, I described a method of crafting armored shoulderpads out of a foam ball, polystyrene sheets, and a bit of imagination. 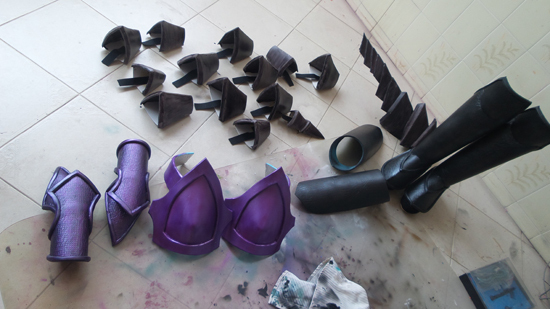 This time, I’ll focus on how to create shoulderpads from a springier material – foam. I first started messing around with foam mats after seeing some of the fan creations from Blizzcon, as well as the amazing work of award winning Korean and Thai cosplayers. The biggest draw about foam is that it’s light, relatively easy to shape, and better yet, relatively fuss free to pack and store compared to polystyrene and plastic. It’s entirely the reason why I chose to use this material for my Netherblade Shoulderpads. While this project focuses primarily on crafting some decent looking rogue gear, the method may be applied to any foam armor project. 1. A sheet of EVA foam mat. You can purchase EVA foam mat from Mash Shop (directions here) for approximately $10. 2. A sheet of large sheet of tracing paper. 4. Heavy grade scissors, contact cement and/or craft glue. 5. Acrylic paint, of the preferred color. 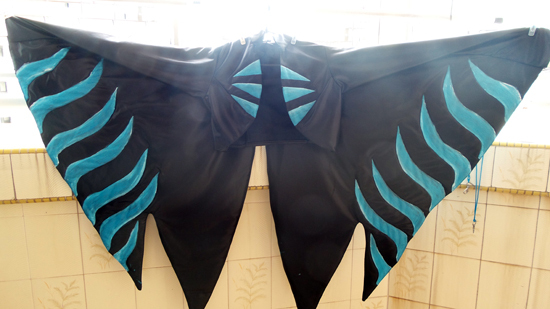 Step 1: Come up with the design of your shoulderpads. Draw out the shape of the component pieces on tracing paper with a marker, and then cut it out. 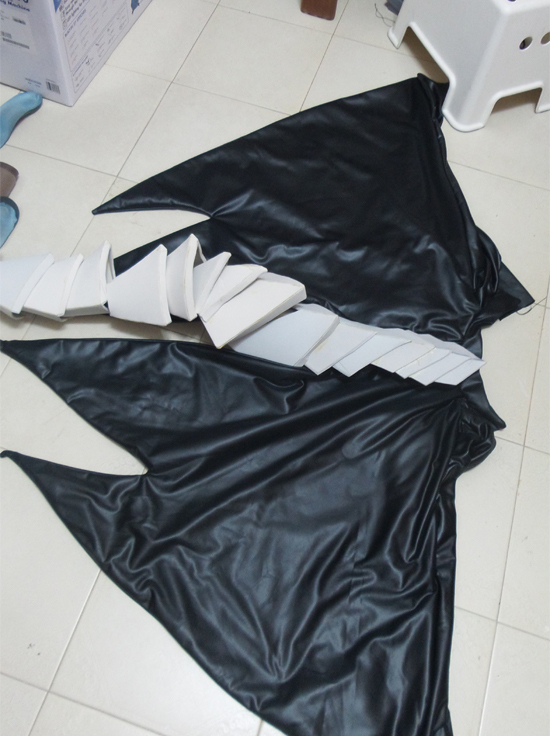 Step 2: Affix your paper pattern onto the sheet of EVA foam, and using your scissors, cut carefully according to the shape on the paper pattern. Cut out all the pieces one at a time. Step 3: We’ll focus on the base first. What we want to do is to give our shoulderpads a 3D feel, so we’re going to crimp the ‘fish-tail’ together. Using contact cement or heavy duty craft glue, join the two halves carefully so you end up with a slightly bell shaped taper. And glue liberally. Hold them together till the glue sets. Step 4: Repeating steps 2 and 3, create the trim and adornments next. Cut out and shape the other foam pieces. This one's the trim. Work the ends the same way as the base. Step 5: Paint both the base and the trim pieces with acrylic paint. Use a dry brush for a metallic finish, and texture for a scratched, battle-worn look. Mix in a hint of black for a ‘dirty’ feel. Here's how the entire thing looks like without paint, with all the itty bitty pieces stuck on. Join the base and the trim together using contact cement. Use contact cement to layer on additional craft foam pieces where necessary to achieve the design you want. Using the half foam ball method described in my previous tutorial, secure it in place as the base for your shoulderpads. Add velcro tape, and you’re done! And there you have it. 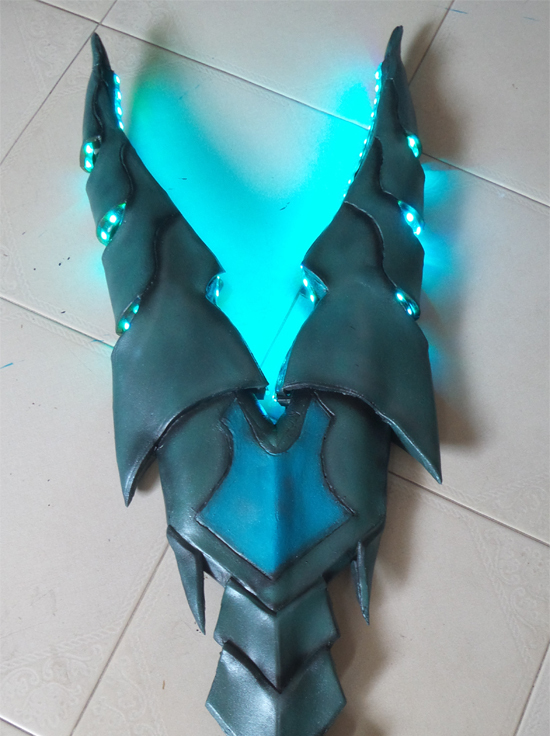 Simple foam shoulderpads, Netherblade style! Nothing screams World of Warcraft like the legendary Frostmourne, the enchanted runeblade of Lich King Arthas Menethil, and guess what? I just got my paws on a life sized, latex replica from Windlass Studios in the mail yesterday! Crafted from heavy duty latex foam with a solid core, the blade’s a stunt ready and convention ready take on the original metal version that allows for a decent boffing, with none of the potential for blood shed. This tasty piece of loot’s going right into my Warcraft cosplay trove, so expect to see me wielding this awesome legendary tier weapon at Cosfest, and beyond! 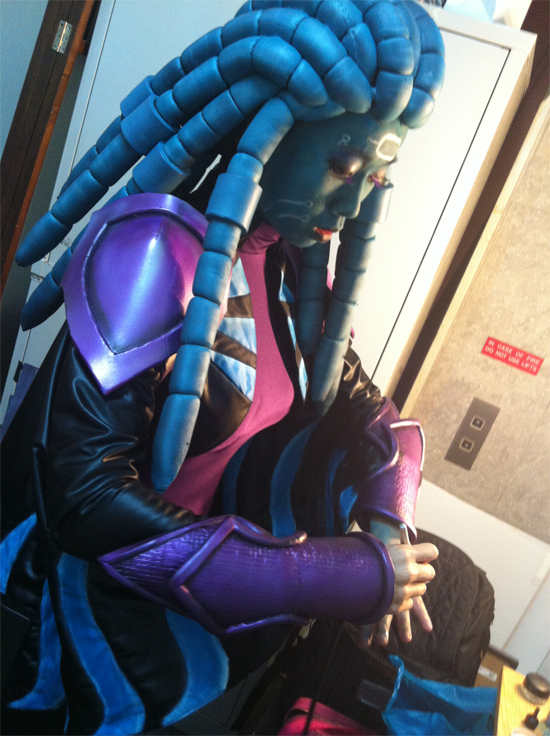 2011 sure has a ton of cosplay events – hell, it’s almost as if everyone’s upped and jumped onto the cosplay bandwagon all of a sudden. First, there was the Singapore Comifest (which is coming back again in June, even), then there’s the Big Three (SOY, Cosfest and EOY), the gaming cons (License2Play and STGCC), and a smattering of smaller cons and gigs in between. And with so many events on the cards, that means this warlock’s gonna be helluva busy, getting his getup together for June and beyond. 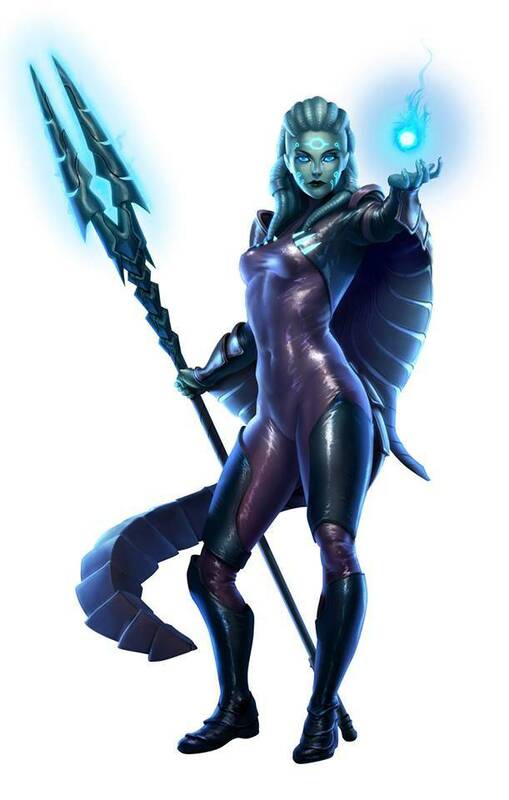 I’ll probably be doing Sith Inquisitor (from Star Wars, Expanded Universe) for the smaller events, or just geek chic casual. How about you folks? What are your cosplay plans this year? I’ve love to find out! If you’ve been following my quickie guide to crafting armored shoulder pieces, then you should be almost all set to put the finishing touches to your very own Corruptor’s Mantle. In this second part, I’ll show you how to tack on the proverbial bells and whistles (and skulls, of course), so you’ll look like a regular warlock when you don this awesome get-up. Waco glass paint and some acrylic texture are gonna be your friends this project. 1. Two foam coits measuring approximately 5-inches (11 cm) across. Also called foam donuts, these are often sold in halves (or can be sliced into halves). $3 from Art Friend. 2. A Plastic/Polystyrene Sheet of approx 0.1 cm thickness – about $5 from Art Friend. 3. Four circular mirrors of approx 3-inches diameter – about $2 each from Art Friend. 4. Eight foam cones. These are typically 10-inches to 15-inches long – $5 from Art Friend. 5. Two leather belts/strips. Cheap leather belts can be purchased from Daiso – $2 each from Daiso. 6. Three styrofoam skulls. The same skulls we used in the Fantasy Wand Tutorial – $3 to $5, from Toys ‘R’ Us or a party goods store. 7. Several metal spokes/garden skewers to reinforce the foam cones. They’ll also be used to affix the skulls to the cones. – $2 for a packet from Daiso. 8. A box of long screws. $2 for a box from Daiso. You’ll also need brushes and paints (acrylic paint, texture, and glass paint), drawing tools, a decent pen knife, a small screwdriver, a hand drill, some craft glue, and heavy duty 3M craft tape. Now that we’ve got a nice, painted base, we’ll need to cut up the bits and bobs that are going on our shoulders. First, use the foam coit as a reference to trace out several stars on the styrene sheet. Cut out the star shapes, and join them to the foam coits with craft glue. Get some color on when the glue’s all dried up. Don't forget to paint 'em! 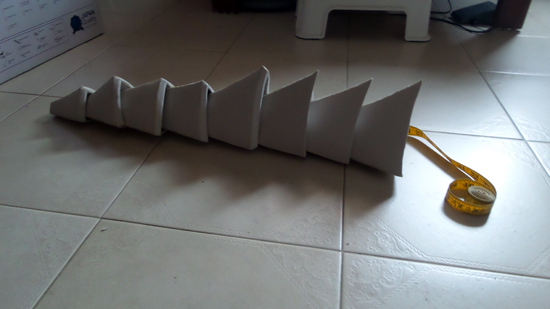 Cut the foam cones into the shape of those nasty, nasty spikes on the Corruptor’s shoulders. Vary their lengths, so you’ve got two long ones, and two short ones. Yep, that's about right. And remember to paint 'em too! Chop off the tips of two of the longer cones, and one of the shorter cones, approximately 1-inch (2.2 cm) from the top. Don’t throw the tips away, because they’re gonna be useful later. Paint the mirrors with glass paint (red, in this case). Using double sided tape and craft glue, affix the mirrors in the center of the foam coits. ... and the mirrors next. Now we’ll work on the trim for the shoulders, and the mount for the coit-star-mirror ornaments. Cut the leather belts to the correct lengths, then attach them to the edges of the shoulder armor pieces using heavy duty 3M tape, and reinforcing with craft glue where necessary. Next, apply 3M tape to the front and rear of your shoulders, near the edge of the base. The tape has it. It's really awesome for securing the belts (which serve as the leather trim), and the adornments in place. Let’s take a look at the spikes next. The spikes can be reinforced by thrusting a single metal spoke through it, dead center. To attach the spikes to the shoulder armor base, use a hand drill to bore a hole through the plastic sheet, then use a screw (with screw threads) to secure them in place. Paint your skulls so they look nice and bloody, then connect them to the shaved cones by skewering them with the metal spokes, and sticking them in place. Cap off the skulls with the bit of styrofoam you shaved off in Step 2, using craft glue to stick them on. Check the screws, tightening them where necessary (and screwing them into the styrofoam) to make sure your spikes stay in place. Repeat for the other shoulder piece, until you have both pieces ready like so. Touch up with paint where necessary, and voila~! 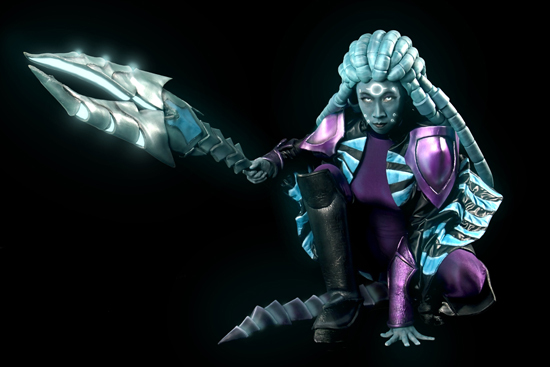 Since I started parading around in my Corruptor’s Raiment, I’ve received quite a few emails asking how I managed to fix up my shoulders. It’s arguably the trickiest part of the entire getup, but hey, making yourself some spanking armored shoulders ain’t all that hard. I’ve thrown together this little guide that shows you how. In this first part, I’m gonna reveal a really nifty secret – what to use as a base for your armored shoulders, and how to shape it. In the second part, which I’ll post tomorrow, I’ll talk about how to assemble those Tier 5 shoulders proper. This tutorial will take approximately 30 minutes to complete. 1. One half of a hollow foam ball. The diameter of this foam ball should be about the same width as your shoulder, if you measure across. In my case, I chose one with an internal diameter of approx. 6 inches (external diameter approx. 20 cm) – $3 from Art Friend. 3. Several pairs of nuts and 1-inch long bolts with screw threads – $2 from Daiso. In addition to the above items, you’ll also need a pair of scissors, a large pen knife, and a hand drill. Step 1: Using the pen knife, cut the foam ball into halves. Cut it length-wise, like so. Watch for jagged edges! Step 2: Buff the edges of the foam half so it’s smooth. Step 3: Cut the plastic/polystyrene sheet to shape. Using a hand drill, pierce two holes through the sheet near the edges where the sheet should be bolted to the styrofoam half. Peel off the plastic protection, trace on your preferred shape, and get ready to do some cutting and drilling! Step 4: Bend the styrene sheet, and stick the bolts in place. Once that’s done, tighten the nuts for a firm hold. Don’t forget to slap on a layer of paint or three in preparation for tomorrow! Bend it like Beckham. Well, you get the idea. If you follow these basic techniques, you can create almost any shoulder armor piece imaginable. The foam ball half is an ideal base for any shoulder piece, and the plastic sheet can be cut into just about any shape and design. They're made the same way. Really. 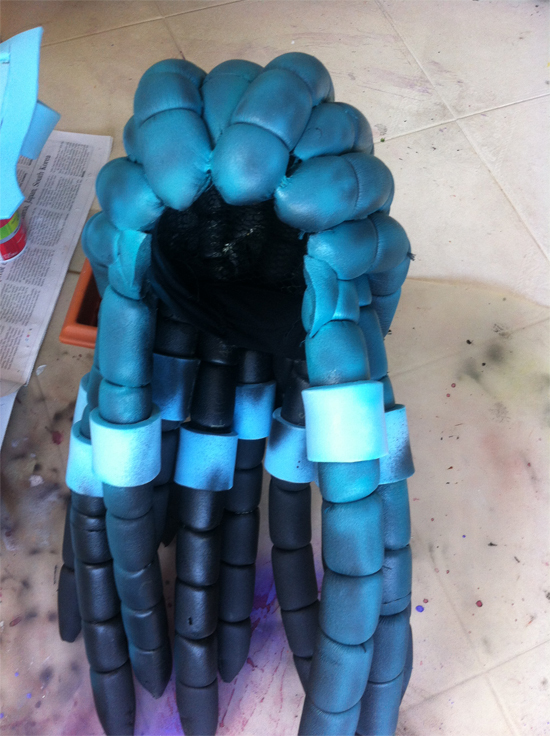 Joey’s (Lord_Angelus) Mage shoulders, for example, were crafted in a similar way, using a smaller plastic piece. XD To anchor the shoulder piece to your clothing, all you need to do is to affix a velcro strip lengthwise, and have the other velcro piece ride on your shoulders. It makes for a really snug and secure fit. XD And now that we’ve got the base out of the way, let’s get it painted and primed, and we’ll start working on the embellishments in a day or two! Until then, cheerio! Everything you need to make yourself a fantasy style wand. And who said you needed the Craft Wand feat, huh? Fantasy fans are no strangers to wands. Wands are to wizards what guns are to gunslingers, and any wizard worth his salt is bound to be packing heat. Before wands were popularized in J.K Rowling’s Harry Potter, they were already all the rage in Dungeons & Dragons. Wands could be crafted from all kinds of exotic and unusual materials, such as amber, cobalt, and even human bone. Computer games, too, added an increasing complex graphical dimension to wand designs – as any player of the latest MMORPGs, especially World of Warcraft can attest. Today, I will cover the basics of creating a simple fantasy wand – one with the finished look of a piece of charred bone, topped with a skull – that’s ideal for a sinister necromancer, villainous wizard, or a World of Warcraft warlock. Overall, this tutorial will take approximately 45 minutes to an hour to complete. 1. A Bamboo Hanging Vase, which we will scavenge for the ‘bones’. – $2 from Daiso. 2. Styrofoam Skull – $3 to $5, from Toys ‘R’ Us or a party goods store. 3. Embellishments – In this case I’m using black feathers ($2 for a packet, from a craft shop), spool silver wire ($2 from Daiso) and black cord ($2 from Daiso). 4. Paint – Acrylic, black and silver (price varies) and Red Glass Paint (price varies). You can pick up paint from Art Friend or any other art supply shop. In addition to the above items, you’ll also need a pair of scissors and craft glue. The whole purpose of getting a Bamboo Hanging Vase - scavenging the parts! Using a pair of scissors, cut open the rattan cords keeping the Bamboo Hanging Vase together. Dismantle it carefully, removing the bone-like wooden sticks. Select one of them (the more bone-y looking one). It’s going to become the base of your wand. Poke a hole in the base of the styrofoam skull using your scissors. Once you have made a small groove, insert the bone-y wooden stick into the hole. Twist it in so the fit is nice and snug. Once that’s done, it’s time to start getting our fingers dirty. Remove the stick, and start painting it liberally with acrylic and a dry brush. Use a layer of black first, to create a base coat. Layer on silver in dabs to create a metallic finish. Several coats should make it look nice and metallic. Once that’s done, we’ll leave it to dry while we work on the skull. Using a fine brush, paint the eye sockets of the skull with red glass paint. Dab it on lightly, and spread it out to make the eye sockets look bloody. You can also paint on magical symbols and runes if you like. Finally, apply craft glue to the tip of your wand, and again inside the hole in your styrofoam skull. Join both parts together.